This is my 3rd cyclocross season. 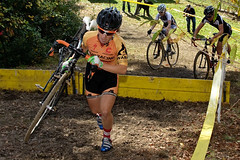 I’d say I focus equally on road and cyclocross, but I definitely have better results in cross. Training for cx is much easier to balance with my law school life. I don’t exceed 2 hours of training in a day (where I was riding no less than 2 hrs a day for the road season). The week is mostly about recovering from the weekend’s races, with a high-intensity day thrown in there. I like to get to the venue a little over two hours before start time. Get numbers, get dressed and jump on the trainer. I like to warm up on the trainer for at least 30 minutes, but usually aim for 40-45. I’ll take a lap on the course, sometimes two if I have time. Check the tire pressure on both bikes, then head to the start, leaving myself enough time to get one or two practice sprints off the line. For DCCX, you had the opportunity to run a clinic the day before the race. Tell us about that experience. We had about 17 women come to the clinic, 6 or 7 had never done cyclocross before. I didn’t expect to have that many new people there, but it is great that there was such an interest. I went through the course with the women in sections, stopping at certain points to practice a particular skill required of that particular spot on the course. About half way through it started pouring, but the women hung in there for the rest of the clinic. Feedback from the women after the race was super positive, so that was exciting. I definitely do not profess to know everything about cyclocross, so I’m glad that what I do know was helpful to them. What more can be done to grow the women fields in the Mid-Atlantic. Clinics like this will undoubtedly grow the sport, not just in the Mid-Atlantic, but nationally. Katie Compton hosted a women’s clinic recently, as did Amy Dombroski. It’s awesome to see the pro women offering their time to raise awareness of the sport. Word of mouth seems to work pretty well too, at least in the Mid-Atlantic. I think women aren’t confident enough in their ability to become an endurance athlete, so encouragement and inspiration from the pro women and men are crucial to the sport’s growth. What equipment did you choose for DCCX? My trusty Cannondale CX 9 equipped with SRAM Force components, with 46/36 gearing (although I am in the process of going with a lower gearing), carbon tubular wheels running at 28psi. To be patient, ride my pace and win. Yup, pretty much! The moment the race was won. First time through the barriers, when I got a gap on Lenore and Julie that they couldn’t bridge. I’ve been practicing run-ups almost weekly, so I’ve gotten much more fluid over the barriers, even ones like those at DCCX that are uphill and practically come up to my knees. I didn’t expect to get a gap there, but I could hear Shawn announcing that I had opened up a little bit of a gap, so I decided then to capitalize on that and start building up my lead. Obviously you got the result you wanted. That being said, is there anything you would do differently before or during the race? I did not ride the section coming off of the pavement of the start stretch well at all. I kept hugging the inside line, which was bumpy and steeper, and probably used more energy the outside line. I kept riding through that section each lap, thinking, “I should have gone over there,” but couldn’t seem to make that happen. I guess I kept forgetting. It didn’t make a difference for this race, but little things like that can really impact a result at a UCI race. When and where are you racing next? 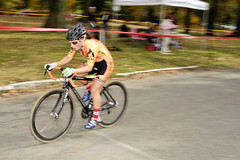 This weekend, Beacon CX and HPCX, UCI events in New Jersey. Any plans on going to Nationals? What were your goals for the season? At this point, do you think you are on track to meet them? My goals are ever changing. I frame my goals in terms of either beating a particular person, or finishing within a certain time of a particular person. My main focus is on the UCI calendar, and I am happy with my results thus far. But, like any athlete, I want more! I’d like to be top 5 in some UCI events, finish top 3 in the MAC series, and improve my current national and world ranking (23 and 62, respectively). I’d also like to finish top 15 at nationals. thanks for teaming up with DCMTB for both the Cyclocross Clincs at Fort Reno and the clinic at DCCX!